U.S. Rep. Ruben Hinojosa has been elected chairman of the Congressional Hispanic Caucus, a group that will take a central role in upcoming discussions about comprehensive immigration reform. 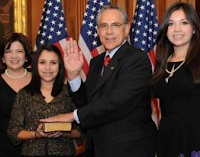 Brownsville, Texas --- U.S. Rep. Ruben Hinojosa has been elected chairman of the Congressional Hispanic Caucus, a group that will take a central role in upcoming discussions about comprehensive immigration reform. Hinojosa, D-Mercedes, was chosen by his peers to serve as chairman for the congressional Hispanics, who will be part of the largest delegation of Latinos at the U.S. Capitol in the nation's history. Hinojosa, the voting bloc's vice chairman in the past Congress, said the caucus will be a leading voice at the national level for passage of comprehensive immigration reform during the next two years. "Our existing national policies are broken and they need to be improved," Hinojosa said Friday. "I have visited with a few friends on the other side of the aisle, and they have told me they're ready to find ways to strike a compromise and make it happen." The caucus, comprised solely of Hispanic Democrats, is dedicated to voicing and advancing issues affecting Hispanics nationwide. Hinojosa rose to the top of its leadership ranks after winning a ninth term in office last week. Hinojosa will succeed former chairman U.S. Rep. Charlie Gonzalez, the San Antonio Democrat who chose last year to not seek re-election. Hinojosa's experience as a legislator and advocate for Hispanic issues will benefit the caucus, Gonzalez said. "Congressman Hinojosa's passion for extending opportunities to Hispanic youth was demonstrated by his tireless efforts on the CHC's Education Task Force and as first vice chair," Gonzalez said in a statement. "I look forward to seeing how his abilities as a strong leader and advocate, combined with the largest delegation of Latinos to ever serve in Congress, will advance the issues most vital to our community." A record total of 30 Hispanics will be in Congress beginning in January, up from 22 for the past two years. Although the caucus will lose Gonzalez and three other members, its numbers were boosted by additions from November's elections. Three freshmen Democrats from Texas will join the caucus next year. Brownsville attorney Filemon Vela was elected to the newly formed congressional district in Cameron County, and state lawmakers Joaquin Castro and Pete Gallego both won South Texas seats. The Hispanic congressmen will serve at a time when there is growing momentum behind a push for immigration reform. Fresh off an election where he won more than 70 percent of the Latino vote, President Barack Obama has said he wants a major immigration bill introduced soon after his January inauguration. House Speaker John Boehner has also indicated his desire to take up the issue next year. Hinojosa said the caucus will "bring new ideas and new vigor" to discussions about immigration reform and other legislative priorities affecting Hispanics.